How do we calculate the costs of renting and buying? How to use our rent or buy calculator? The rent or buy calculator is designed for everyone who wonders whether it is better to rent or buy a house. 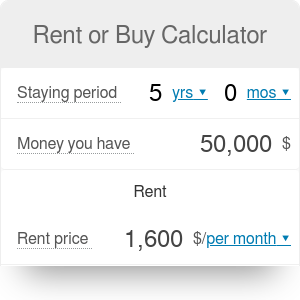 We made this calculator to help people like you choose between renting and buying. With our easy-to-use rent vs. buy calculator, you can be sure that you will make the right decision. If you are in a hurry and just want to quickly obtain the approximate results – fill in the fields in our calculator and compare the results. If you have more time and you prefer to comprehend the calculations – read the text below and try the advanced mode. After this, the question “Should I buy a house?” won’t be puzzling anymore. For most of us, the choice between renting and buying a home is one of the most serious financial decisions. We are wondering what is more profitable when we (or our child) go to university, when we move to another city, or when we think about moving to the bigger home. The estimation of renting costs is quite simple, and you don’t need any specialized knowledge to do it. However, as you will see in the next section, a few things that should be taken into account might be surprising. On the other hand, the computation of the total costs of buying is more complicated cost of mortgage. It requires not only some understanding of financial mathematics but also vast knowledge of different variables that should be considered in the calculations. Don’t worry, though – our rent or buy calculator takes into account the most important factors associated with buying a house and will help you make the right decision. Scenario 1. At the beginning of the simulation, you move to the new city and start renting a home. At the same time, you put all the money you have on the saving account. During the period of the analysis, every month you pay the rent and receive interest from your savings account. At the end of the time horizon, you just move out and leave the city. Scenario 2. At the beginning of the simulation, you move to the new city and buy a home. To finance the transaction, you take a mortgage. All the money you have is a down payment. Every month you have to pay installments from your mortgage. In addition, you have to cover the additional costs like annual property tax and home owner’s insurance. At the end of the time horizon, you sell the home, which price (thanks to appreciation) is now probably higher than at the beginning and repay the mortgage. After that, you spend one part of this money to repay mortgage; the rest is your profit. Here you have an explanation of all variables that our rent or buy calculator takes into account while computing costs of renting a home. Rent price – the price you pay to the property owner on a weekly, monthly, or yearly basis. This value shouldn’t contain the utility costs. As we mentioned above, these costs are more or less the same in case of buying and renting, so our calculator excludes them. Agent commission – the one-off payment you pay to your estate agent. Other costs – all other costs related to renting a home (e.g. costs of moving-in, minor apartment adjustments, extra furniture, renter's insurance, and so on). Interest rate (deposit) – the average yearly deposit interest rate in your bank. If you plan to spend all the “money you have,” just enter zero. In this section, we explain the variables that affect the total cost of purchasing a home in our rent vs. buy calculator. Cost of the property – the total cost of purchase and adaptation of the property. Interest rate (mortgage) – your mortgage rate for a fixed-rate loan. You can check it in your bank. If you are not sure, leave the default value which we set on the basis of the 30 years fixed mortgage rates in the United States. Loan term – the time within which you have to pay back the loan (usually 30 years). Appreciation – the annual growth rate of the home value. Other fees – other fees related to buying and owning a house. For simplification, they are expressed as a percentage of the value of the property. The most important are listed below. If you are not sure what you should enter here, you can use our approximate values for the average property. Buying and selling commissions - real estate agent commission, title insurance, loan origination fees, transfer taxes – 4% and 7% respectively. First of all, you have to define the time horizon of the analysis. The staying period is a period in which you are planning to stay at home until you move out (or sell the home). Secondly, you have to assess how much money you have. When buying a home, this money will serve as your down payment*. In case of renting, the calculator assumes that you will put down this money on the saving account. Provide the necessary information in the Rent and in the Buy parts of the calculator (for details, see the section Cost of renting a home and Costs of buying and owning a home). In the fields Rent cost and Buy cost, we present monthly (or weekly and yearly) cost of renting and buying. T We skipped the utility costs to simplify the calculations. We assumed that these costs are more or less the same in case of buying and renting and shouldn’t have an influence on your decision. In the fields Total rent cost and Total buy cost, we compare the overall cost of renting and buying within the whole period. These values are also compared in the graph. Total rent cost is a simple sum of all monthly payments to the owner, agent commission and others fees minus the money you will earn on savings account. Total buy cost is a sum of all payments made during the staying period increased by an amount of unpaid mortgage and decreased by the value of the property at the end of the set time horizon. If the calculator shows a value below zero, it means that you will earn on buying! *Down payment is cash you pay upfront when buying a home. Usually, you need to have at least 20% of the property value in cash. Otherwise, you may be forced to buy additional mortgage insurance. Rent or Buy Calculator can be embedded on your website to enrich the content you wrote and make it easier for your visitors to understand your message.